When introduced in 2006, the K10D was the top-of-the-line Pentax DSLR. The robust “semi-pro” body is much larger and heavier than its predecessors. The K10D incorporates the then new in-camera “shake reduction” (first introduced in the K100D), dust and weather seals, and it can operate lenses with in-lens focusing motors (SDM or DC). It was a success on the market and won the Japanse Camera Grand Prix 2007, the European EISA Camera award 2007, and the 2007 TIPA Digital SLR Expert award. As Pentax and Samsung co-operated from 2005 until 2008, Samsung lauched a twin camera model badged as “Samsung GX-10”. The K10D GP camera body, D-BG2 GP Battery Grip and the O-ST55 Camera Strap make up the “PENTAX K10D Grand Prix Package”. This limited edition package was sold in July 2007 as a commemoration of the K10D winning the prestigious Grand Prix 2007 Award in Japan. The camera body and battery grip are lined up with dark-brown rubber. 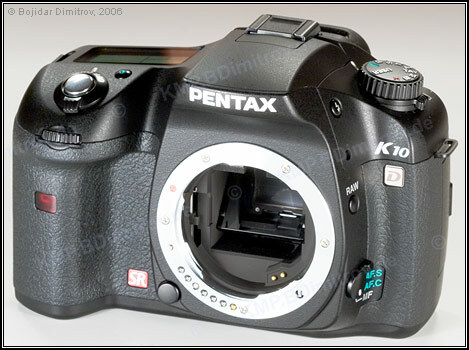 The PENTAX logo on the camera’s pentaprism housing, the K10D logo at the upper-left corner of the camera’s front panel, and the mode digital indications are accented in a standard gold color signifying the limited-edition status. The “CAMERA GRAND PRIX 2007” lettering and the award logo mark are also displayed on the lower part of the LCD monitor of the camera’s back panel. The specially designed leather camera strap features the “CAMERA GRAND PRIX 2007” lettering, the award logo mark, and the K10D logo, in the same gold color. Each camera body is identified with a serial number, which is exclusive to the PENTAX K10D Grand Prix Package. Pentax produced 5000 Grand Prix packages, and about 200 were sold in Germany for 1099 Euro each.